Face the Ace is a primetime show of NBC Entertainment. It is an exciting poker TV show where contestants can win as much as $1 million if he or she can defeat three pro poker players. This is a new poker theme show that can offer different level of excitement especially for all poker fans. It is aslo a wonderful opportunity to get important Texas Holdem tips from the professionals. It was first aired August 1 of 2009 and it is hosted by Steve Schirripa and Megan Abrigo. The TV show is sponsored by Full Tilt Poker that supplies them with aces. 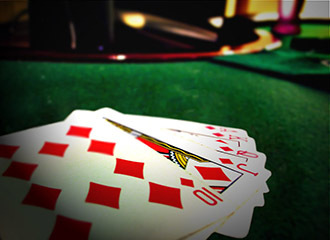 Poker players ages 21 and up are qualified to join this poker game. All aspiring players must undergo a free qualifying round at Full Tilt Poker and chosen players will fly to Las Vegas to shoot at Cin City Studios. There are 4 doors for players to choose from and behind each door there is a professional poker player to beat in order to win the game. Some of the potential professional poker players that players might face are John Juanda, Phil Ivey, Erick Lindgren, Howard Lederer, Andy Bloch, Allen Cunningham, Gavin Smith, Jennifer Harman, Mike Matusow, Chris Ferguson and many more popular expert poker players. Each contestant need to face the Ace during a heads up game of Texas Hold’em poker. If the player defeats the professional player, then he or she can choose to take US$40,000 or risk the money to challenge another pro for a second match. For the final round, the prize will increase up to $1,000,000. You need to defeat 3 pro poker players in order to get the jackpot prize. These are 4 smoked glasses to choose from and once he or she chooses a specific door, then the pro will walk out to face the player. The second prize next to $40,000 is $200,000. The player will again be given the chance to walk away with $200,000 or play for the $1 million round. The sad part is that when a player loses for the next round, then he or she will go home with nothing. This makes the game very exciting especially for poker fans watching the show every week. Even if you are not a poker fan or a gambler, you can still enjoy watching the show because of the different level of excitement that it provides. It is a game show that features how exciting poker game is and how entertaining the game is even if you are just watching how players play the game. This is not a boring poker tournament. Some poker TV shows needs to show the audience what is happening between each player to capture their attention, but this new game show has a different concept. If you think you can beat a pro poker player, then why not join this game show and play for $1 million. Today, there are lots of television shows that feature poker game, but this is one that you must not overlook. After watching the show for the first time, you will surely look forward watching it again and again.